Christmas might be over, but we won’t stop celebrating until we’re back at our desks feeling hungover and glum on Tuesday morning. Whether your plans are partying the night away or sitting in front of the television, we’ve compiled a list of all the best shows to watch or record on TV over the New Year’s period. Yes, the new Sherlock special is included. You’re welcome. The hilarious West End comedy comes to the BBC with an adaptation of the hit stage show. Filmed in front of a live audience, an amateur dramatics group presents a highly ambitious production of Peter Pan – but things don’t exactly go to plan. We’re sadly missing Chatty Man, but thankfully Alan Carr is not leaving us for New Year’s yet! In this very festive New Year’s special, Alan will fill the studio with prime celebrity guests, including Danny Dyer, Keith Lemon, Greg Rutherford, Laura Whitmore, Sinitta, Will Mellor, Gemma Collins, Professor Green and Teiks. Graham Norton will celebrate the New Year with guests Michael Fassbender and Marion Cotillard, who will chat about their new film Assassin’s Creed; James McAvoy, who will be speaking about his new film Split; and Frank Skinner, who is hosting a new series of Room 101. It just wouldn’t be New Year’s without Jools! This year’s Annual Hootenanny includes performances from vocalist Chaka Khan, Christine and the Queens, Roy Wood, Rag’n’Bone Man, Gregory Porter, Martin Fry, Seasick Steve plus many more! Everyone’s favourite Britain’s Got Talent winners (probably) present a new series in which they invite members of the public to enter a competition to win a chance dance with them. This isn’t exactly the kind of thing we’d go in for after eating a few too many mince pies over Christmas, but watching others is still great festive fun. The second episode of the new series sees Granville buy some mood-altering devices, Leroy in trouble with Mrs Hussein and Mrs Featherstone deciding to solve a delicate problem of Mr Newbold’s. The one we’ve all been waiting for! 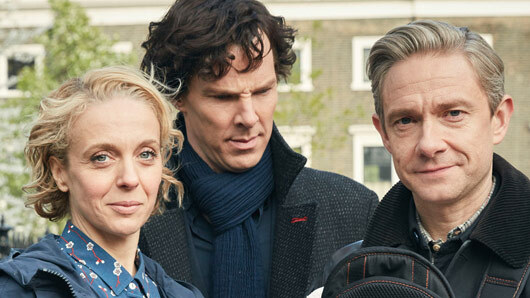 Sherlock returns to our screens to investigate the return of Moriarty (“Do you miss me?”), but soon becomes caught up in the case of a mysterious criminal who is vandalising pictures of former PM Margaret Thatcher. How might these cases be related, and what does it all have to do with Mary Watson’s shady assassin past? Agnes steps in when Bono starts being bullied at school, but her interference only makes the problem worse. Cathy has a new boyfriend, but can he impress Agnes? Meanwhile, Grandad is back from hospital with a prescription for medical marijuana.